AAS 33 /CLASSIC/ - New AMATI Eb alto saxophone, student model. This model is a further development of the most popular AMATI student saxophone in the past years, the AAS 32 model. The new AAS 33 model is a result of extended research and inovation in terms of sound quality and keywork design. 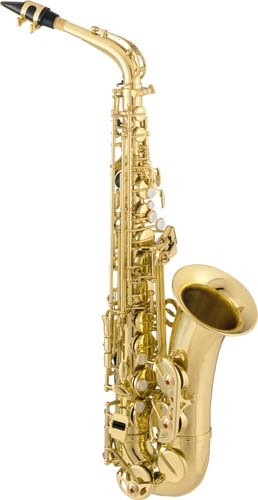 The new tonal characteristics make this saxophone the perfect choice for schools. Keywork: Auxiliary front F mechanism, C#-Bb connected table key, low C# key lock, screw adjustable G-G#-Bb linkage and low C# key. Standard Features: Drawn tone holes, Adjustable thumb rest, High quality leather pads with metal boosters, Adjustable key guard felts, Detachable bell & bow. Standard Finish: Highly polished and protected with Gold lacquer. Complete with Gigbag, hard rubber mouthpiece, cleaning swab and strap.